MOGADISHU, Apr 22 2013 (IPS) - In the Hamarweyne market, Mogadishu’s largest, 24-year-old Maryama Yunis is finding success with her tiny cosmetic store. The young Somali entrepreneur has been in business for two years, selling everything from soaps and shampoos to lipsticks and eyeliners, and now she’s turning a decent profit. “As more and more young women in Somalia grow increasingly aware of their looks and like to take care of themselves, the cosmetics business has naturally grown and I took the plunge to meet that demand,” Yunis told IPS in Mogadishu. Yunis is one of a growing number of women in this traditionally conservative Muslim country who are going into business because of the opportunity to attain financial independence and upward mobility. Even educated women in this Horn of Africa nation are expected to focus on raising families, but attitudes are shifting alongside women’s role in society, says Hawa Dahir, a social activist in Mogadishu. “Times are changing in Somalia and people are now more aware of the entrepreneurial potential of women and are more accepting of the role women can play in the economy of the family and the country as a whole,” Dahir told IPS in Mogadishu. Yunis herself is a university graduate. She studied nursing but opted to pursue her dream of becoming an entrepreneur instead. “With my mother’s help, I managed to convince my father to allow me to follow my dream and start the store. With the money I am earning, I am becoming more independent by the day and I’ve become an inspiration for many young women,” Yunis said. But for many women, entering the world of business is not a choice but a necessity forced on them by the death or unemployment of their husbands, according to Dahir, who studies women in business. 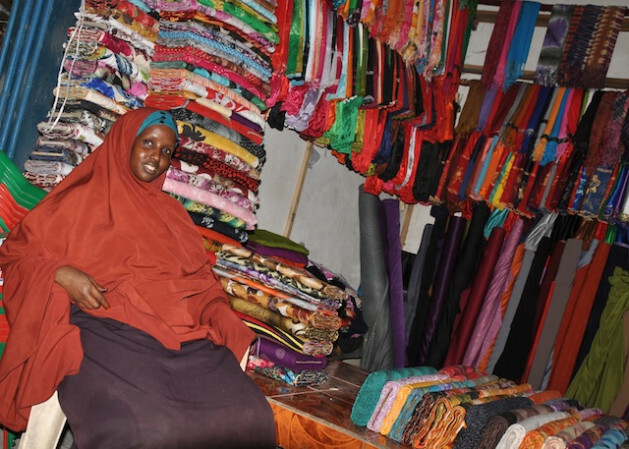 Faduma Maow has a shop in the Bakara market in Mogadishu, where she has been working as a clothes trader since the death of her husband three years ago. The mother of four told IPS that she takes her children, aged between seven and 15 years, to school before heading to the market. “It is tough being a working parent, but it can also be rewarding. I am financially independent and pleased to say I am making progress towards my goal of raising a family and building a stable future for myself and my children,” Maow said. Dahir said that while there are no reliable statistics on Somali women entrepreneurs, their presence in the country’s small business scene is “palpable”. Women are involved in a range of small businesses, selling clothes, cosmetics, fruit and vegetables, or khat – the leaves of the Catha edulis shrub, chewed as a stimulant in Somalia. Women can also be found selling fuel in open-air markets and on street corners in Mogadishu. And they are doing it all with very little assistance. Somali businesswomen say working as an entrepreneur has its challenges. Firstly, it is nearly impossible to raise capital to start a business. Local and international financial institutions closed down following the collapse of the central government in 1991 that marked the beginning of two decades of civil war. A couple of local banks have now been established but one handles only savings and remittances from Somalis in the diaspora. The other does offer loans, but only to those who can put up collateral, which few women have. “It is not possible to get money to start up a business – even more so if you are a woman,” Aisha Guled, a khat trader in Mogadishu, told IPS. Guled herself got her start only thanks to support from a relative. She said that she has been struggling to make ends meet since she started selling khat. “Most of us have started with the little we could get and struggled up the ladder. Some don’t make it, others remain stuck in the beginning, but some are lucky enough to break even and make a profit soon and expand,” she said. Though the Somali government says it is trying to do all it can to help businesswomen working to support their families, one official told IPS that the government cannot at this stage offer financial support to businesswomen. “The provision of a secure environment for women to operate in is a key priority in supporting women in business,” the official said on the condition of anonymity. “Despite all the challenges that women entrepreneurs face in Somalia, the country’s womenfolk are showing that they are up to the challenge of being shrewd business operators, while maintaining their roles as mothers and wives,” Dahir said. She called on academics to study the rise of Somali women in the business sphere as well as in politics and other fields in society. Yunis said that as Somali society’s views and attitudes towards women’s role change, she expects more and more women to take up roles not only as entrepreneurs, but in academia and politics as they prove themselves to be equal to men in every aspect of life in Somalia. “It is just a matter of time before we see many women join men in equal measure in rebuilding our country because our society is changing thanks, in part, to the changing times; women will be more equitable to men in every area,” said Yunis. Inspiring! Thank you for the nice article.